Introducing BurnAware, full-featured disc burning software. BurnAware is a full-featured and free burning software to create CD, DVD and Blu-ray of all types, including M-Disc. Home users can easily burn bootable discs, multisession discs, high-quality audio CDs and video DVDs, make, copy and burn disc images. 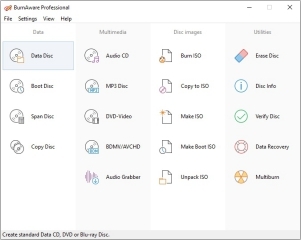 Power users will benefit from BurnAware's advanced options, including control of boot settings, UDF partition and versions, ISO levels, session selection, CD text for tracks and discs, data recovering, disc spanning and direct copying. Read release notes for latest version or view complete changelog. Support of a wide range of optical disc data storage, including CD, DVD, Blu-ray discs, Double Layer discs, M-Disc, rewritable and extra large capacity DVD and Blu-ray. We offer a full range of burning software with something for everyone, it can be full-featured free burning software or commercial software with extra tools.